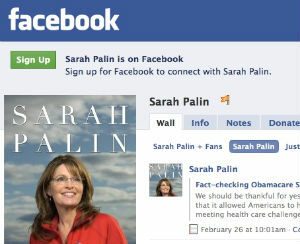 Former Alaska Governor Sarah Palin posted what is being hailed as a “masterpiece” of the genre of Facebook status updates Tuesday, wowing both literary critics and fans alike. The post has received millions of views and sparked questions about Palin’s political future. The post was part an expression of thanks to her many fans in the social networking community, and part mission statement. The post transcends the normal limitations of the Facebook update genre, says Earl Ablenon, Professor of English at Duke University and an author of several biographies of famous American authors. Ablenon cited specific parts of the post as examples.